Africa was a big trip for us; we were celebrating the conclusion of Chris’ MBA program. Our trip was three weeks in length and we spread that over five countries. 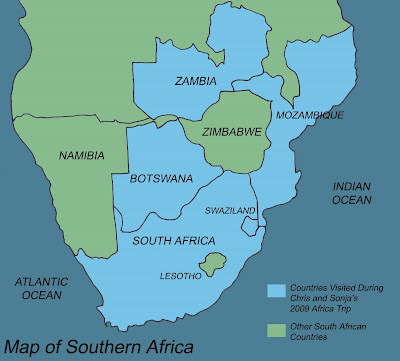 The plan was to join a Botswanan safari for the first portion and then drive through South Africa to Mozambique where we hoped to relax on the beach and do some diving. Fly from Seattle to London, Heathrow (9 hours flight time). Spend the day in London. 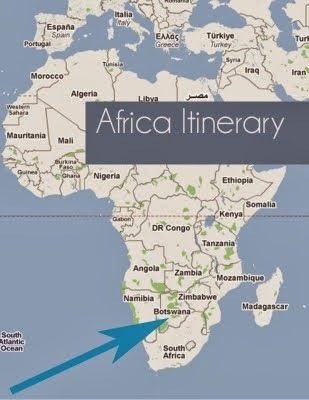 Fly from London to Johannesburg, South Africa (again, roughly 9 hours of flight time). Fly from Johannesburg to Livingstone, Zambia (2.5 hours perhaps? I can't rightly recall). Arrival in Zambia. Hooray! Spent three days in Livingstone, living on an island in the middle of the Zambezi River, touring villages and viewing Victoria Falls. Hooked up with our fellow safari-goers and headed into remote Botswana. Spent 10 days trying not to be eaten by lions. Visited three camps, including one is Botswana's famous Okavango Delta, the largest freshwater delta in the world. Ended the tour in Maun (Botswana) and flew back to Johannesburg, South Africa. Rented a car and drove 650 km through South Africa and Swaziland to a resort at the very tip of Mozambique. Spent six days relaxing on the beach and horseback riding. Drove back to Joburg with just enough time to.. Hop onto a plane to London and then, eventually, home. WOW! How long was your trip? That's sounds really busy. Three weeks. It was enough time to not feel rushed but enough so that we were glad to come home. I was actually thinking of you when I wrote that since I remember you telling us that three weeks was a good amount for Australia, as well. Same thing. It's not worth spending two days to get someplace if you're only going to be there for a little while. I think you are right. 2 weeks would have been to short after flying all that way. Although I think I could spend a good month down in NZ!